Home / Gemstones Enciclopedy / Emerald Gemstone eyeglasses: Nero or Lapo? Emerald eyeglasses: Nero or Lapo? Who is more fashionable? Green has always been the color of hope, it symbolizes the awakening of nature and the coming of spring. Green is associated with fertility that ensures the continuity of life. Ancient Egyptians mined Emerald as early as 3500 BC. The ancient Romans also excavated it in the mines located in the Alps. 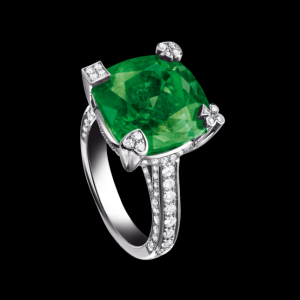 The ancient Romans believed that multifaceted Emerald helped the eyes to relax. In fact, in ancient Rome some wealthy and powerful individuals, including Nero, used polished Emeralds as eyeglasses. The Emperor Nero of Rome is said to have watched gladiator fights using two emeralds as the corrective lenses. Nero inspired a curious designer of the modern era Lapo Elkann to launch a line of equally extravagant eyewear. Egypt has always been the oldest and the only significant source of this elegant Beryl variety. The Egyptians believed that this gemstone had a power to raise the dead, and buried many mummies with an Emerald around their neck. After the Spaniards explored emeralds in Colombia, the global geographical scenario has been completely changed. When extraordinary deposits of Emeralds were discovered in South America, the Egyptian source became obscured. The Spaniards encountered fierce resistance, and many Incas refused to reveal the location of their mines even under torture. In fact, the Incas considered Emerald Gemstone to be a very important part of their treasure. With the passage of time, using torture and brutal strength, the Spanish could know the great secret that was revealed to them by Inca called Vale Loqui Nones. He said there was a river flowing down to the Inca land from a province of Quito in Equador. And that river was littered with Emeralds that the Incas picked up. There was no need to dig as Mother Nature had already done that dirty job to bring them to light. 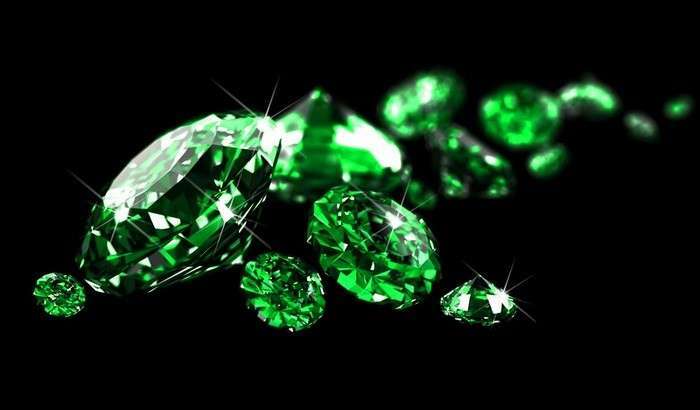 Soon after Loqui Nones had revealed the secret of the River of Emeralds, Inca Emeralds appeared in Europe. 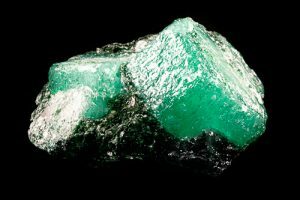 The most common shape of the Emerald crystal is the elongated hexagonal prism, sometimes with streaks on the longer side. Emeralds contain Beryllium, Aluminium, Silicon and Oxygen, and one or more traces of Chromium, Vanadium or Iron. They can be formed either in metamorphic rocks or in sedimentary rocks associated with hydrothermal veins. But most of the mines are found in metamorphic zones, except the Colombian ones that are found in sedimentary rocks associated with hydrothermal deposits. Almost all Emeralds have inclusions visible to the naked eye, so the inclusions within the gem are actually accepted as marks of being genuine. Emeralds that have no eye-visible inclusions are extremely rare, and are known for their great value. Perhaps the only flaw of this almost perfect Gemstone is that it doesn’t have an exceptional hardness. 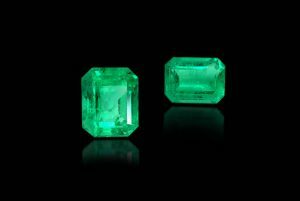 Emerald has a hardness of 7.5 – 8 on the Mohs scale, but it does not affect its great value. The Emerald Hollow Mine is the only emerald mine in the world open to the public that allows to dig free Emeralds. 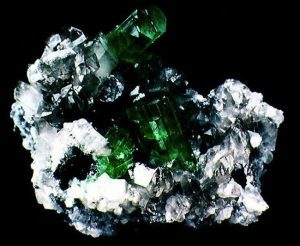 It is located in the city of Hiddenite, in North Carolina, and is recognized as one of the most unique and interesting geographic locations in North America. In Kamakanga, the largest private mine in Zambia, you can buy stones directly from the cutters, who acquire them from the mine owners. Many mines are found in metamorphic zones, where the Pegmatites meet with the Shales; for example in Brazil (Ceara, Bahia, Minas Geiras, Goiàs), in Zambia (Kafubu Field) and in Zimbabwe (Sandawana). In Colombia, however, the Emeralds are found in the eastern part of the Andes, in sedimentary rocks associated with the hydrothermal veins. One of the most famous mines in Colombia is the Muzo mine, where the notable Trapiche Emerald was discovered. The Chivor and Coscuez are two other flagship mines in Colombia. Currently the largest producer of Emeralds is the La Pita mine discovered in the late 90s and located in Minas Gerais, Brazil. In La Pita mine the cutting-edge technologies are used, and sound environmental practice is one of the top priorities. 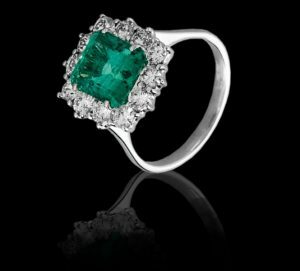 High-quality Emeralds can surpass even Diamond’s per carat value, as it happened at Christie’s auction, where a price for a 5-carat flawless Emerald has reached double the price for a 5-carat clear Diamond. When John F. Kennedy was going to buy an engagement ring for Jacqueline Bouvier he wanted to choose the most precious and beautiful stone ever, and doesn’t matter if it were a Diamond or Emerald Gemstone. So he chose to give Jacqueline one of the most legendary rings in history, the piece of jewelry that will never lose its historical charm. The crossover ring designed by Van Cleef & Arpels boasted a stunning 2.88-carat Diamond beside a 2.84-carat Emerald of incredible beauty. As this gem does not have a very good hardness and stability, it is not recommended to clean Emerald Gemstone with ultrasonic cleaners. For the same reason we always recommend settings such as Pavè, Bezel and Invisible setting. The most popular cut is the Step-Cut, with a large square or rectangular table and faceted corners. In a perfect emerald cut the long and narrow facets of the crown run perpendicular to the facets of the pavilion.